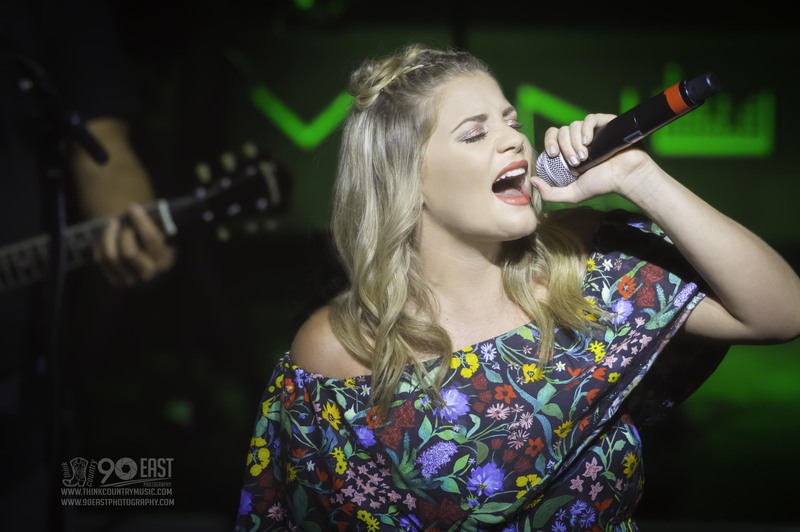 In what was truly a GIFT to Western New York country music fans, Lauren Alaina brought her show to the intimate setting of Buffalo’s VENU nightclub. Just nominated for the highly coveted title of CMA New Artist of the Year, she is one of the hottest female acts in country music right now, and seeing her show in small venues at bargain prices will probably become more and more difficult to do. If you were one of the lucky fans in attendance at VENU, pat yourself on the back. You not only have great taste in music, you’re financially wise with your concert budget. Opening for Lauren Alaina was Buffalo, New York native Caitlin Koch. Koch, who now calls Nashville home, has strong roots still firmly planted in her hometown. She still returns to Buffalo regularly to play several events throughout the year and to connect with her family. 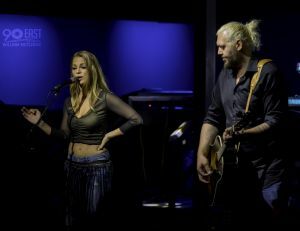 Koch chose to perform her set with the simplicity of a microphone for herself and an acoustic guitarist named Dylan Hund. It was noted that Hund only learned her songs the day before. In Nashville, musicians learn songs on the fly all the time, so nobody takes notice. In Buffalo? Maybe not so much, so we’ll make mention of it. Good job Dylan! Wearing a brown, long sleeved half shirt with hip hugging blue jeans and a fringe belt, Koch was perfectly put together, yet completely casual. This was the hometown crowd and she was prepared to look good, but she knew who she was playing to. These aren’t fancy people, they don’t expect fancy back, especially from one of their own. I think she had her wardrobe radar pointed properly in the right direction as far as her fans were concerned. Keep it simple, like you’re playing on your back porch, because essentially, she was. Kicking it off with a song called “In My Head” co-written by Koch, Damian Fontana and Jason Lee Mattia, it immediately showed us why this young woman made the move to Music City to pursue songwriting and performing as a living. She can belt out a tune. Her range is somewhere where most of us don’t even dare to dream. When Koch sings, she is noticeably controlled. She barely moves, only occasionally stepping aside for some understated dancing, but generally she remains solidly parked in front of her mic stand. Her style reminds me more of a blues club singer than your traditional country artist. The voice itself handles the audience. Even the very best in the business aren’t above performing someone else’s work. “Sound My Gun”, co-written by Dave and Angie Debem, was one of those songs that seems custom made for Koch’s voice. You could almost feel the room shake with attitude. 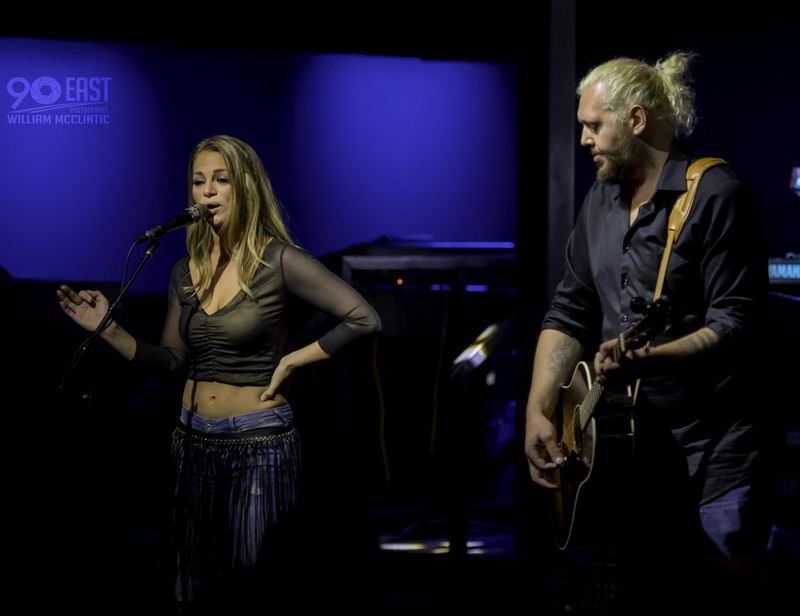 Koch was fortunate enough to open for Cassadee Pope at C2C, one of the UK’s biggest country music festivals last year. Afterward, Koch and Pope’s drummer, Tom Whall collaborated to write “One They’re Gonna Miss”. It was a standout at the VENU show. Koch rounded her set out with covers of Dolly Parton’s “Jolene” and Chris Stapleton’s “Parachute”. She finished strong with a pumping version of Stevie Wonder’s “Superstition”. To say it’s been a good year for Lauren Alaina would be an understatement. She had her first number one hit in March 2017 with “Road Less Traveled”, the title track of her latest album and she was just nominated for a CMA Award for Best New Artist, not to mention she’s touring like mad and the song she and Kane Brown recorded together, “What Ifs” is getting heavy radio play. If you haven’t heard of her, get out from under your rock. The thing about Lauren Alaina is, these things didn’t just happen overnight and generally they never do. She’s more than paid her dues. She’s been working at this game for years, ever since her season 10 “American Idol” appearance, where she finished as a runner up. It’s been a long time coming. As I said in the beginning, her show at VENU was a GIFT to anyone that was there. The price of a ticket was $15.00. You read that right. FIFTEEN dollars. I look at a lot of concert ticket prices and for an artist like Lauren Alaina, this was a bargain. It won’t be happening again Buffalo. If you were there, hold on to that ticket for posterity’s sake. You’ll have bragging rights in the future, especially if she wins the CMA Award she was just nominated for. Lauren Alaina’s band took the stage, got things going, and about a minute later, she entered, wearing a flowy, floral dress with strappy black sandals. Her voice was clear and powerful on the opening number, “Queen of Hearts” from her latest album. “My Kinda People”, another track from the new album was next, followed by an older favorite, “Georgia Peaches”. During both numbers, I couldn’t help smiling. This artist has a knack for engaging with both her audience and her band while performing that makes you feel as if everyone knows everyone personally, and it isn’t contrived. Up to this point, the energy level was really building in the right direction. “Crashin’ The Boys Club”, “18 Inches” and “Barefoot Buckwild” followed and then the moment so many fans of Lauren Alaina always wait for. For those who aren’t yet that familiar with Lauren Alaina, let’s give this the space it deserves. I’m going to try and recruit you into her fold via one song. “Next Boyfriend” was co-written by Alaina, Emily Weisband and Matt McVaney and appears on the “Road Less Traveled” album. The premise is simple. Alaina spots a guy she seems to feel fits the bill as, well, her next boyfriend. “You look a lot like my next boyfriend, I can’t believe how much you act like him… You and me, we’d be unbelievable, and I’m available…” you get the idea. The music is incredibly catchy and the song is now a fixture on every show’s setlist, and there’s a reason for this. Just before “Next Boyfriend” is played during each show, a male volunteer is chosen from the audience to come up on stage to BE Alaina’s “Next Boyfriend” and dance with her while she sings the song. This has become the highlight of her show. Fans wait for it, and new fans are created all the time because of this gimmick. It was a brilliant decision to start doing it, and seeking out “Next Boyfriends” from different cities on YouTube has become a pastime of people just for fun. The dance moves range from highly skilled to couldn’t bust a move if they were on fire, but almost always, they generate a laugh because the volunteer tries their best to find a way to be entertaining. My personal favorite to date was a guy named Dylan who danced with Alaina at Red Rocks in Morrison, Colorado. Look him up. That’s about the result the song performed live should generate. Feel free to continue watching more from there. I promise you might get hooked. You can thank me later. Anyway, as usual, Alaina sang “Next Boyfriend” in Buffalo. She got her volunteer. At VENU, the guy was someone named “Brandon” (I tried very hard to locate “Brandon” or someone who knew him for a comment, but had no luck). Expecting the normal craziness, I had my Facebook Live ready to go and everything. This was the pinnacle moment of the evening. “Brandon” got up on stage and seemed to be a little bit lackluster. Alaina almost immediately gave him a word of warning, “You know Brandon, if you volunteer you HAVE to dance.” I figured he was just a slow starter. I figured wrong. Barely ever getting anything going at all, was it possible that “Brandon” was the least engaging “Next Boyfriend” EVER to dance with Lauren Alaina? I can’t say for sure, but I had a couple theories. Maybe he was so star struck, he just couldn’t move much. Maybe he lost a bet with a friend and the loser had to volunteer, even if this was the last thing on Earth he ever would have wanted to do. That’s why I wanted to talk to this guy. Or, maybe “Brandon” is just going to end up the poster child for who NOT to be if you volunteer to be Lauren Alaina’s “Next Boyfriend”. I don’t know, but the bottom line is, in other shows, both Alaina AND the guy entertain the crowd, which is exactly how it’s supposed to go. Here, she had to carry the whole load by herself. It was a bit of a letdown. The good news is, there will be many more Lauren Alaina shows for Buffalo folks to get to. She isn’t slowing down. Next up was “Doin’ Fine”, which ended with an audience singalong. Not bad for a track from her latest album that hasn’t even been a radio single for long. Proof that people really do still buy and listen to whole albums. Coming from someone who always believed in the “deep tracks”, this is something I’m learning to take notice of in a changing industry. Wearing her emotions on her sleeve, Alaina put the brakes on everything to talk to her audience honestly when describing “Three”. “My favorite song I’ve ever written.” She may have scored a number one song in March, but prior to that, there were six long years on the road and five singles that didn’t do very well, and she wanted to write a song that thanked everyone who supported her during those lean years where they just kept going anyway. “Three” was that song. It’s a song that will give you shivers. Alaina’s voice somehow delivered it spot on, even with her heart poured out all over the stage. She’s a pro. Her huge voice covered Katy Perry’s “Firework” next, followed by that big number one, “Road Less Traveled”, which is a message for all people to be themselves. You can’t ever be anyone else, no matter how hard you try, so allow yourself to be you and the right people will gravitate toward that. Alaina closed her show with a mega-medley of songs by female artists including “Wide Open Spaces” (Dixie Chicks), “Fancy” (Reba McEntire), “Baby One More Time” (Britney Spears) and “Last Name” (Carrie Underwood). After the show, Alaina met with fans to sign autographs and take photos. The line was long, but she stayed. She appreciates her fans and they appreciate her. If they were with her from the beginning they are now feeling the fruits of their efforts. If they have just discovered her, they’ll probably be fans for life. The crowd and the venue in Buffalo weren’t large, but the music and the heart of the artist were. I think that’s what people will remember most.